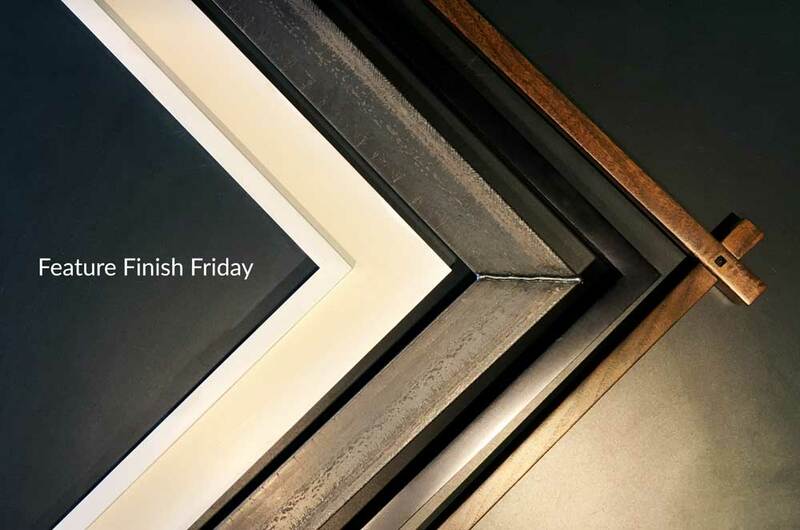 About a month ago, we began a weekly Facebook installment we are calling Feature Finish Friday as a way to highlight some of the more unique, interesting and sometimes also time-intensive finishes we see on our frames. The idea was to share what goes into these finishes and what we find most interesting about them, as well as ideas for their final use. While we know that many of you may be following along on Facebook, we wanted to take a moment here and recap what our first month of this installment looked like. From time to time we’ll post recaps like this for our most favorite Feature Finish Friday installments, but look to see them all every Friday on FB (and if you’re not yet a fan of our page, take the time to visit and click that “like” button!). Walnut Medium Brown Black Wax Finish on our Sully style frame, CL 229. This finish has as much to do with the inherent sexiness of walnut wood as it does with the finish we apply to it. 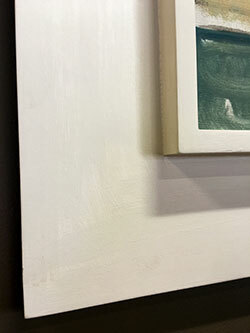 The inconsistent grain and sap lines of the wood allow for visual interest and texture in the frame. 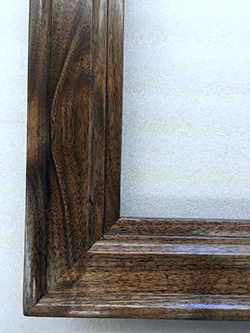 For this finish, we stain the frame with a light medium brown stain to make the wood more consistent in overall tone. The dense openings in the grain are then filled with a black wax, highlighting the natural beauty and inherent variation of walnut wood grain. The residual wax is then polished to a beautiful, lustrous sheen that is both durable and timeless. When applied to this profile, the grainy wood, waxy finish, and beautiful shape of the frame work harmoniously together to create a rich, and visually interesting look for a simple beveled mirror that makes the frame the show stopper in any room. Maple Black Satin Lacquer Finish in the spray room. Is a finish that on the surface looks simple, but in reality is anything but. Our lacquer frames are typically sprayed over maple as it sands to the perfect smoothness necessary to achieve the glass-like surface of this finish. This is one of our most time intensive finishes, requiring multiple rounds of sanding and priming (with sanding in between the priming) as well as layers upon layers of lacquer to coat and conceal the wood grain. 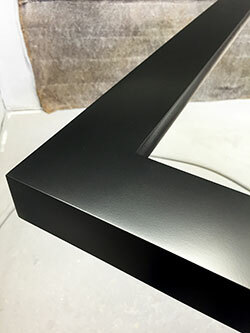 The Black Satin Lacquer finish will take up to 10 coats of paint with drying and curing time necessary between each layer. This is a deceptively simple looking finish that has a lot of time and care put into it and is perfect for any contemporary setting. Our Welded Steel frame line is one of our most sought after frame categories. Our steel distributors supply steel to construction sites, pipe fitters, welding warehouse facilities and us, your custom picture framer. We can finish the steel in many different grinding patterns and finish combinations that bring a sleek look to our frames, but our Raw steel is the epitome of the Industrial design look. Inherent in this finish is that we leave the steel untouched, showing off the beauty of the random textures and scaling in the steel as it comes to us. 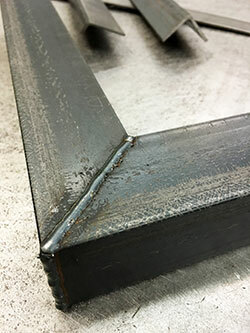 The Raw steel finish will always show off the corner welds of the frame, instead of grinding them away as we do with many of our other steel finishes. Our Raw finish is coated only with a clear sealant once it is welded together in order to protect the look of the frame for years to come. Welded steel frames are a great alternative to more traditional picture framing materials, and truly embody the increasingly popular Industrial Chic design trend. They are also a fantastic consideration for any couple celebrating their 11th wedding anniversary – how better to use the traditional gift of steel than with a framed work of art? When an opaque lacquer is too smooth and showing wood grain is not ideal, our Hand Painted China White is a strong alternative. After coats of primer are applied, our finishers use a special brush to hand apply a thick layer of a dead, flat, white paint. This allows the wide strokes of the brush to show texture, but in a subtle, minimal way. The strokes are long and the paint is consistently applied, to create a finish that rivals only the beauty of the art itself. We love this finish on contemporary oil paintings – especially on our step profiles with varying panel widths and heights. It’s a finish that has a feature spot in our Cambridge showroom on a painting by abstract expressionist Jason Berger. Click here to see a video of Hand Painted China White in the process of being finished!